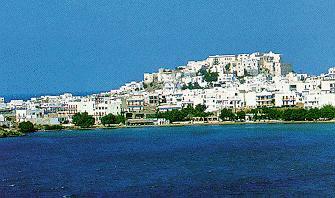 Naxos is the largest and most mountainous of all the Kuklades. Looking like a miniature "big island of Hawaii," it is the island of Dionysos and Ariadne, two of Ancient Greece's adored gods. The island has left its mark on the Kyklades with ruins dating back more than 2500 years, mosaics and temples for all visitors to see. 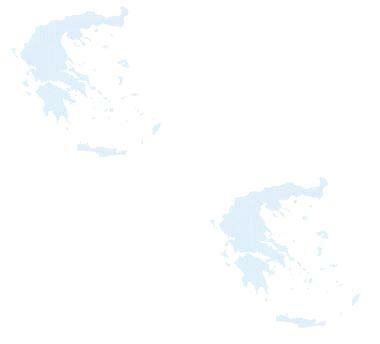 The surface area of Naxos is about 443 square kilometers and is roughly eliptical in shape. It has a total of 148 kilometers of seafront. Three peaks, Zeus (Thiá) at 1004 meters (about 3400 feet), Kórono (100 meters) and Fanára(930 meters) have between many beautiful valleys and coll areas fro those wishing to escape the heat of the summer. Naxos itself produces just about everything from wheat and cereals to olive oil, materials, fruits and vegetables. Climate is rather changeable from 27 to 30 degrees (75-90F) in the heat of the summer at sea level to 14-18C (55-65F) in the winter. Hiking or roving up the mountains reduces the midsummer sun and makes for pleasant walks. The first inhabitants of Naxos were the Thracians followed by the Karés who made their mark on the island by naming it after their king, King Naxos. Subsequently, Naxos became a sea power and conquered places in Sicilly and the Ionian islands. After that the island became another Venetian outpost until it passed to the hands of Greeks and became part of Greece together with the rest of Kykládes during the revolution against the Ottoman Turks. Naxos today has kept the Kykládic architectural style very much alive and has been relatively little influenced by outside factors, unlike Mykonos or Ios. Transport: By air there are 2 flights a day, and more in the summer. The trip takes 50 minutes (info: 01/966 6666). Olympic Airways flies there. There are schedules and fare info as well. By ferry, there are between 1 and 5 ferries per day, depending on the season, and the trip takes 6-7 hours (info: 01/4226000). From Rafina there are ferries that runs throughout the year. It takes 7 hours (info: 0294/22300). By flying dolphin, you can also go to Naxos in 2 hours. This is the main port of entry and the main town on the island. Right on the port is the white Entrance where, it is said, used to be the entrance to the temple of the god Apollo, the God of Love. As mythology recounts, Ariadne, taken by the unbelieving Theseus, slowly and sorrowfully dissappeared into the sea, causing Dionysus to arrive to the island and to give the gift or fertility in honor of his departing love. The whitewashed "kástro" (castle) which overlooks the entire town is a must see and not to be missed as is the temple of Apollo. Nearby the Mycenian tombs are also another sight as are numerous other archaeological finds, described below. On the way to the village one meets the Mycenian Tombs as well as a memorial to the liberation of Naxos during the second world war (14-Oct-1944). Further on, we meet the castle of Naxos, Délio, as is the only Turkish memorial on the island, constructed by Ismail Hasán of Naxos (1759). We finally reach Egkarés, built in the middle of fertile valley. Here is found the main spring of the island and the site of the Venetian Epáno Kástro. You can reach the castle by foot in about 45 minutes or an hour and bring plenty of water if you undertake the hike in the summer. A very nice village, site of the ruins of a pelasgic tower, near a waterfall. The story goes that when the Thracians occupied Naxos, two of them, Síkelos and Ekítoras, abducted the king's daughter and both wanted to marry her. The King told them that this would be decided as follows: the brothers would have to build two important structures, one being the water reservoir and the other, the tower and whoever finished first would be able to take his daughter's hand. However they both finished at the same time and killed each other in the ensuing battle. The climb starts at Agia Marina, about 22 kilometers from Naxos, after we traverse a village called Apíantho. A path leads through the forest and about 30 minutes later we pass by a huge monolith onto which are written "OROS DIOS MILOSIOU" meaning that the area was dedicated to DIAS (Zeus). About an hour later, we arrive at the peak, situated at an altitude of 1004 meters. The view is not to be missed, because on a clear day we can see all the way to Crete in the South and to Turkey in the East. Komiakí is the northern most village on the island and the nearest to the seaside village of Apollo. It is built on a wonderful site, in a valley which leads to Apollo. There is much local produce here from fruits in the summer and tastefull vines and grapes, to wonderful apples and pears in the fall or autumn period. The local church, "Theosképasti" (means covered by God) celebrates every September 8 with a street fare, and is a site well worth staying to experience. Apollo, found on the seaside, is a lovely little port with an absolutely beautiful beach. Facing North East, it should be avoided with any wind, but in the middle of the summer, it should be superb. Here was also found a bust of a young man, called "the Statue of Apollo" even though the experts dont agree that it was dedicated to God Apollo.